At a recent roundtable event organised by Esri UK, representatives of the North Wales police force, Wessex Water and the Environment Agency talked about how they were using geographic information systems (GIS) in their work to provide Operational Intelligence (OI). The focus of the discussions revolved around how each organisation needed to deal with emergency situations – particularly around flood events. For the Environment Agency, the focus is shifting from a reactive response to a more proactive position. Using a mix of internet of things (IoT) devices combined with more standard meteorological weather forecasting and satellite data, the department is aiming to both avoid flooding through dealing with issues before they become problems and to better respond to problems when they are unavoidable. An example here is in using topological data in order to predict water runoff in upland areas and then to use analytics to better understand what that may mean further downstream. Nick Jones, a senior advisor at the Agency, described how it is also using real-time analytics for OI – an example here is in holding certain stocks of items such as mobile flood barriers, but being able to get them to a point of greatest need at the right time via a just-in-time logistics model. This allows for the optimisation of inventory – and avoids issues with the public when they find that items that could have prevented a flood were available – but in the wrong place. Wessex Water also has to respond to such events. Floods can force sewage up into streets and gardens, or even into people’s homes. Andy Nicholson, Asset Data Manager at the company, described how the company was using GIS-based OI to better prioritise where to apply its resources in emergency situations. 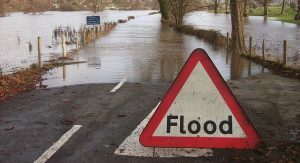 For example, partnering with the Environment Agency to gain access to its data means that Wessex Water can track the progress of a flood – and can then both advise its customers of possible problems and allocate people and other resources to go and mitigate issues by working to potentially stop, redirect or slow down any issues caused by a flood event along the areas it has responsibility for. Likewise, the North Wales police force has a responsibility to citizens. Dave Abernethy-Clark, a PC with the force, described how he came up with Exodus, an OI system using GIS data to provide the force with a better means of dealing with vulnerable people during events such as a flood (but could also be a fire, civil disturbance or any other event). Again, the real-time and predictive usage of OI can be invaluable. It is better to evacuate a vulnerable person before an event overtakes them. However, doing this based on just basic safety assessments can mean that a vulnerable person is removed from their property where there is actually little real need to do so. OI ensures that only those who are very likely to be impacted are identified and dealt with, minimising such upsets and saving resource costs and time. Andy Nicholson from Wessex Water also emphasised how OI should never be a single data set approach. By pulling together multiple data sets, the end result is far more illuminating and accurate. The use of a flexible front end is also important – he discussed how one event resulted in a complex situation appraisal being shown on a screen. From this view, it looked like the event could be a major one that would impact a large number of customers. However, with a few extra filters in place, he managed to narrow this down to just a few core points being shown, and this then allowed for causality to be rapidly ascertained and the problem dealt with along with the minimum impact on just a few customers. The takeaways from the event were that OI is an increasingly valuable tool to organisations out there. The increasing capabilities of tools and the underlying power of the platforms they run on means that real-time OI is now possible. The opening up of different organisations’ data sets also means that other organisations can directly plug in to existing useful – and often free – data. The way that these three, seemingly disparate organisations worked together to deal with an emergency event such as a flood was apparent. By all of them (plus other groups) being able to work against the same underlying data and using collaborative systems built over the OI platform, the sum total of the capability to deal with an event is enhanced greatly. How this helps all of us cannot be underestimated.